South Korean tech giant LG has recently announced its second device, Q8, in the famed Q-series lineup. The launch comes prior to the official release of its previous handset Q6. The durable IP67 device inherits core features from LG’s flagship lineup of the ‘prosumer’ V series. It features a 5.2-inch QHD IPS Quantum display with resolutions of 2560 x 1440 pixels (570ppi) while the secondary IPS Quantum display has resolution of 160 x 1040 pixels with 570ppi. The handset’s customizable, always-on second screen on top of the main display makes for a handy shortcut to contacts, tools and apps. Powered by Qualcomm snapdragon 820 mobile platform it comes with 4 GB LPDDR4 RAM and 32 GB of UFS ROM expandable via a micro-SD card to up to 2 TB. The water and dust resistant Q8 comes protected by a metal frame with rounded corners that absorbs the majority of shocks and vibrations. The company claims that it can be safely immersed in up to one meter of water for up to 30 minutes. It further incorporates a fingerprint sensor along with Vulkan-compatible 3D graphics engine. Backed up by a battery capacity of 3000mAh with Qualcomm Quick Charge 3.0 it runs on Android 7.0 Nougat. On optics front, Q8 houses a 5 MP camera on front with 120-degree wide angle lens and Dual cameras - 8 MP with a 135-degree wide angle and 16 MP with 78-degree standard on the back. 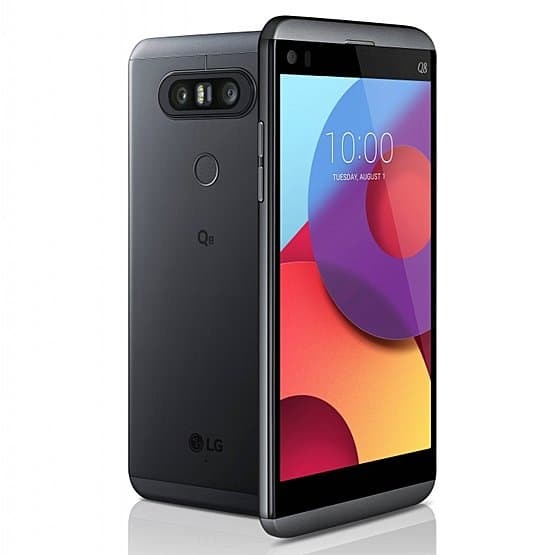 Connectivity options include 4G LTE, Wi-Fi 802.11 a, b, g, n, ac, Bluetooth 4.2 BLE, NFC ,USB Type-C. LG Q8 would retail as Urban Titan colored variant first in the key European markets starting this week, followed by markets in Asia next month. The company was quoted to be selling LG Q8 for €599 (about $699) in Italy earlier this week however the pricing details for other European markets may or may not remain the same.